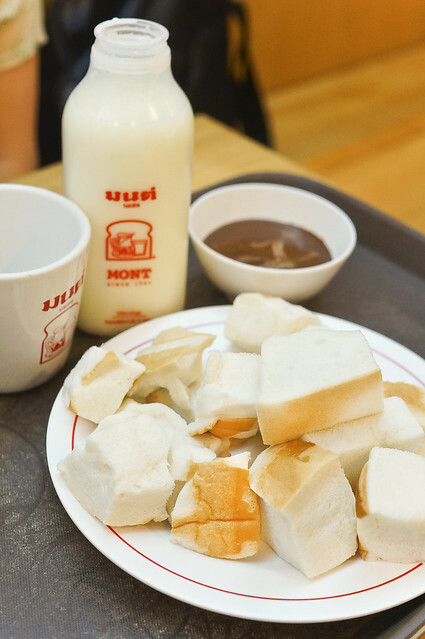 Mont Nom Sod is a cafe that specialised in toasts and milk that is situated at level 2 of MBK Center (Mah Boonkrong). The outlook of the cafe is not exactly impressive but don’t be fooled by their simple interior design. 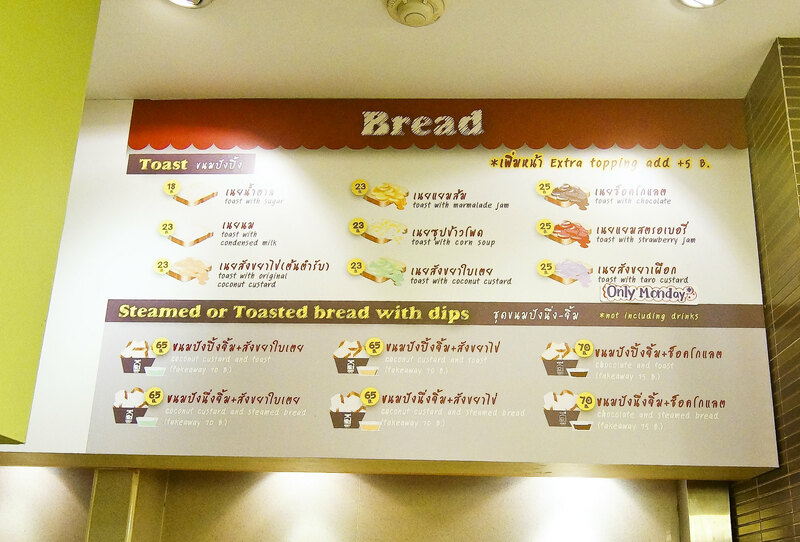 It looks our typical Singapore’s Ya Kun or Toast Box and the price is really economical as well, at about 23 baht per slice of toast bread. Generally, Mont Nom Sod offers two kinds of bread, the toasted bread slices topped with a spread (like Coconut Custard, Condensed Milk, Chocolate, Taro spread, Pumpkin spread and Corn spread just to name a few) and the second kind is their soft steamed bread with a dip (coconut custard or chocolate dip). Mont Nom Sod’s bread is nothing like our square white bread where the texture became a little tough after toasting, or really crispy like Ya Kun’s. Their toast is crispy on the surface and fluffy soft on the inside. Their Coconut Custard is in fact similar to our Singapore’s Kaya, just that there is lesser egg taste and stronger coconut taste. The aromatic coconut fragrance simply filled my mouth when i took my first bite. The bread didn’t became soggy even when it’s spread over the bread for a period of time. I know this because, as usual, I took quite some time for the food shot. I always have a thing for condensed milk toast. Who didn’t spread condensed milk over their toast when we were kids? 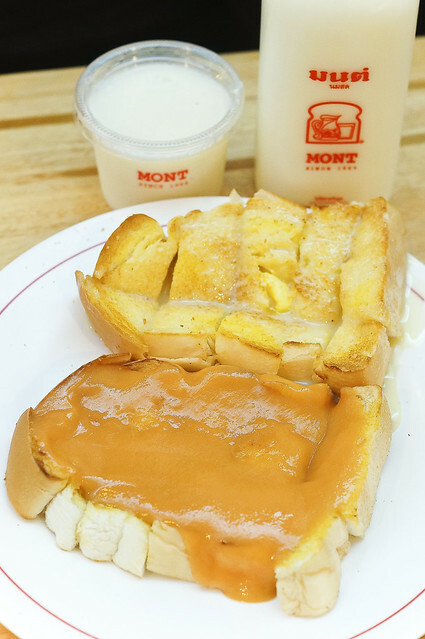 For Mont Nom Sod’s condensed milk toast, the last thing to worry is the condensed milk taste overpowering the toast and turned into a nothing-but-sweet-tasting toast. The condensed milk are applied in moderation with butter, and the sweetness is just nice for a supposedly-sweeter kind of taste. If you have tried Old Town’s steamed bread, Mont Nom Sod’s steamed bread’s dough is fuller, more like a Man Tou (White Steamed Bun) texture but without the grease. At only S$2.80, i get to enjoy a steam bread chocolate fondue. How good is this? Chocolate dip is rich and smooth and bread is fluffy and soft. No complain! I also had their Sweet Cold Milk. Unlike chocolate flavor or strawberry flavor milk, white fresh milk is normally not as sweet but Mont Nom Sod’s is a sweetened version. I guess the Thais really like sweet stuff! The milk is worth a try, and after all, what is a visit to milk cafe without trying their milk? Mont Nom Sod is a cafe which serves simple, yet delightful food at a very minimal price, which made me very happy after having my meal here. 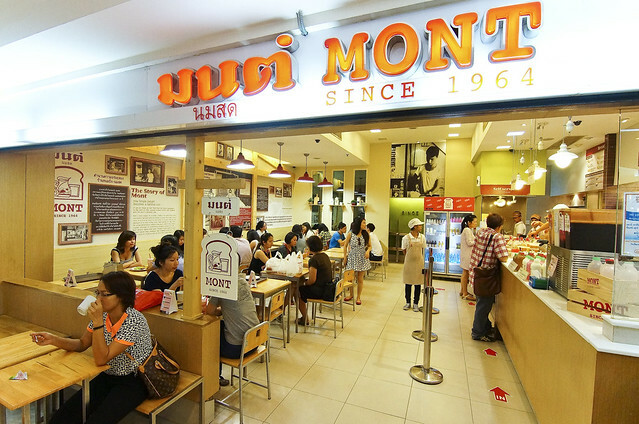 Some people classify Mont Nom Sod as one of the hidden gems in Bangkok. I like this cafe and thought that i will visit this place again on my next visit. I still have many bread flavors which i had yet to try. This place is a perfect place to rest after walking for hours, and to refuel your energy. 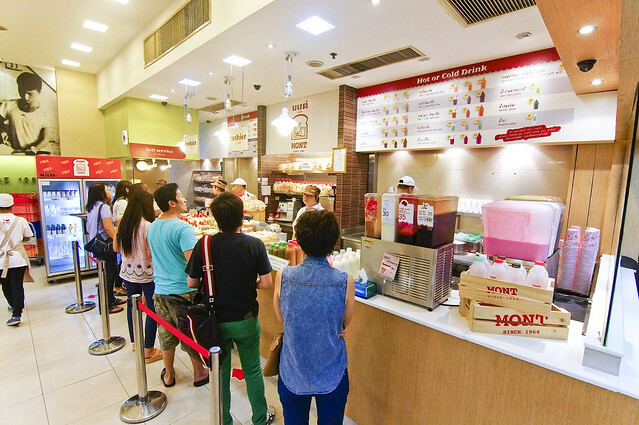 Give yourself a sweet sugar rush and continue with your shopping Part Two!